The site is a parking lot at 290 Tremont St., near Tufts Medical Center. A parking lot in Chinatown could be replaced with a 30-story tower full of affordable housing units — with a permanent home for the neighborhood’s new Boston Public Library branch on the ground floor. 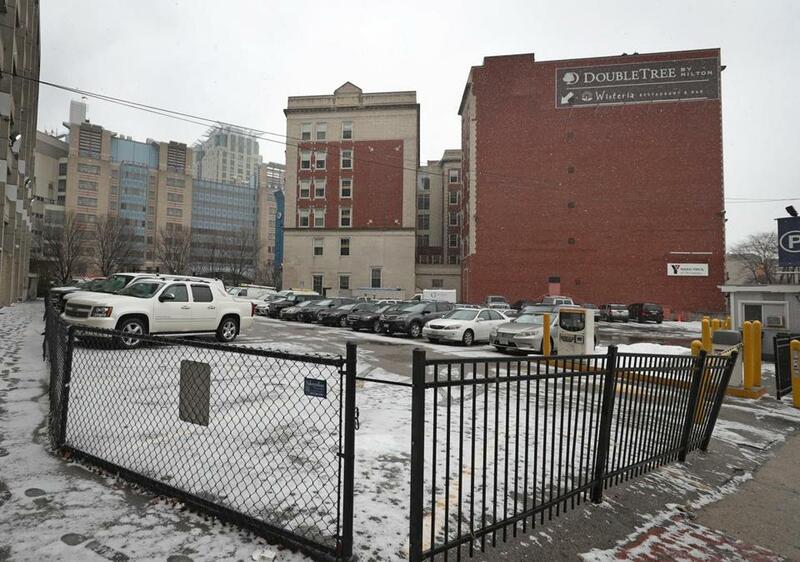 That’s the plan proposed by a quartet of developers for a city-owned lot on Tremont Street near Tufts Medical Center. It calls for 171 apartments and condos aimed at lower- and middle-income residents, along with room for a nearby hotel to expand, a hospital garage, and space for the library. The project pitch — from Millennium Partners, the Asian Community Development Corporation, Corcoran Jennison Cos., and Tufts — was the only response to a request for proposals for the site issued last fall by the Boston Planning & Development Agency. The BPDA wanted affordable housing, said director Brian Golden, but was pleased to see the plan also calls for much-needed community space. “As we review this proposal we think it’s going to pay significant dividends to the neighborhood and to the city,” Golden said. The $174 million project would be paid for, in part, by the Winthrop Square tower, which Millennium Partners plans to build on a different city-owned garage site a half-mile away, near Downtown Crossing. As part of its bid to win that hotly contested site, Millennium proposed a partnership with the Asian CDC to build affordable housing downtown or in Chinatown, using its city-mandated affordable housing payments as financing. When the opportunity arose to buy Parcel 12 — as the lot is known — it made sense to build such housing there, said Angie Liou, executive director of the Asian CDC, which builds affordable housing in Chinatown. It and other community groups have long considered the lot a potential site for housing in a part of town that is being squeezed by nearby development. They also brought in Corcoran Jennison, a veteran Boston development company that owns the neighboring DoubleTree. The hotel would be expanded to seven floors of the new tower, adding 140 rooms. And Tufts Medical Center, which has a garage next door to the site, would add a 264-space garage. With its hotel component and financing for affordable housing coming from larger projects nearby, the development would in some ways be similar to the Beverly, a “workforce housing” building being erected by the developer Related Beal near North Station. Mayor Martin J. Walsh has hailed it as a model for creative approaches to dealing with Boston’s housing crunch. Nearly 6,000 people applied to rent one of 239 affordably priced apartments in the Beverly. Most of the 171-unit Tremont Street tower would be condos for sale, Liou said, priced in the $200,000 to $300,000 range so as to be affordable to families earning $80,000 to $100,000 — those with incomes at or below the median for a family of four in Greater Boston. About 45 units would be set aside for lower-income renters. Affordable for-sale housing, not just rental apartments, has recently become a bigger priority for the Walsh administration. The need is great: A building in Chinatown with affordable condos last year drew 1,600 applicants seeking to buy one of its 51 units. The Tremont Street project plan sets aside 8,000 square feet on the ground floor as a permanent home for the new Chinatown branch of the Boston Public Library, which is set to open this winter in temporary space in a BPDA-owned building on Boylston Street. The BPL is studying options for permanent space but has made no commitments. The group Friends of the Chinatown Library wrote to the BPDA supporting the concept of a library, but also noting that feasibility studies suggested 15,000 square feet of space would be needed. Even though Millennium, the Asian CDC, and their partners filed the only development proposal, there’s no guarantee they’ll be awarded the site. The BPDA is likely to decide in the next few months. They also need to negotiate a price for the land, Golden said, and determine how much Millennium will contribute in affordable housing funding from its Winthrop Square project. That sum will be calculated based on the size and mix of the condo and office tower, currently planned for 691 feet tall, that Millennium will build at Winthrop Square. But it’s likely be in the tens of millions of dollars. Millennium is also set to pay more than $160 million for the garage site itself, money Walsh has allocated, in part, to affordable housing developments in East Boston and South Boston. That compares with the $15 million Millennium made in affordable housing payments for its Millennium Tower condo project at 1 Franklin St., under a deal cut when then-mayor Thomas M. Menino was eager to relaunch a failed project that had left a notorious hole in the heart of Downtown Crossing. Today, the city has a stronger hand, Golden said, and will push Millennium to pay as much as is required under the Walsh administration’s new and tougher affordable housing rules. “The affordable housing approach taken by Millennium at Millennium Tower would be unacceptable today,” he said.